Let's sing a song of butterflies! 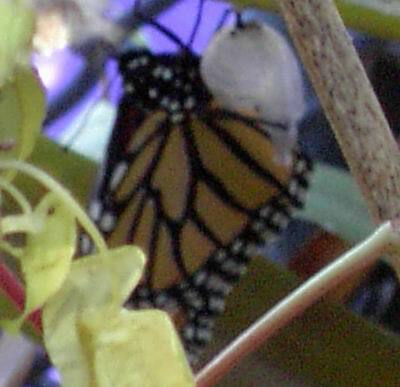 When is the butterfly going hatches? Every time it goes in the butterfly egg. 1006 butterflies shining in the egg. And then in all days he grows up to be a Monarch. And when the rain stops he always puts a ring around him. And always says: “Oh, Oh”,but he’s oh, oh .. He flies, flies in the wind. Click to hear the Hatching Monarch song..
A child sang this song for the first butterfly that emerged in our classroom. Click to hear the "Butterfly Friend" song. A child wrote this song after we released our first Painted Lady in the garden. Click to hear the Painted Lady song. It's shining in the hall..